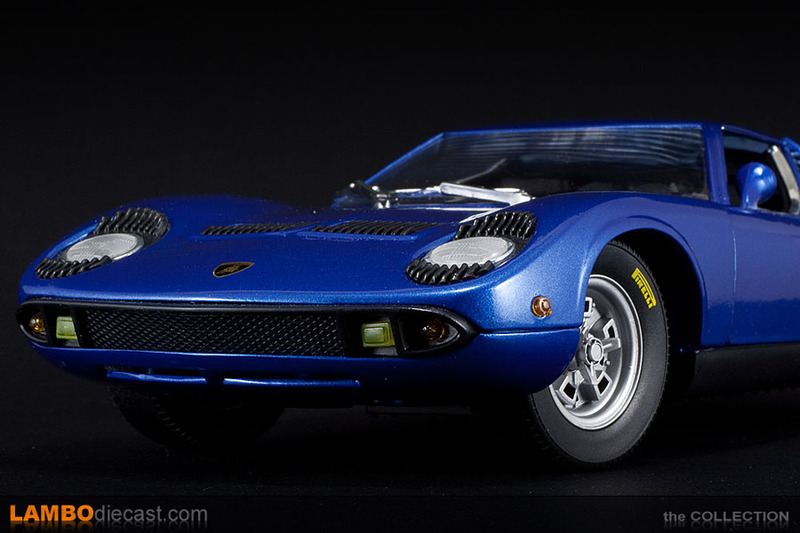 I actually already own two of these Anson made 1/18 Lamborghini Miura P400 models, one in yellow and one in red, but when I saw this blue metallic one listed online I just couldn't resist, this is a very nice shade on the Miura, and with that combination of black and tan interior it is nearly perfect. 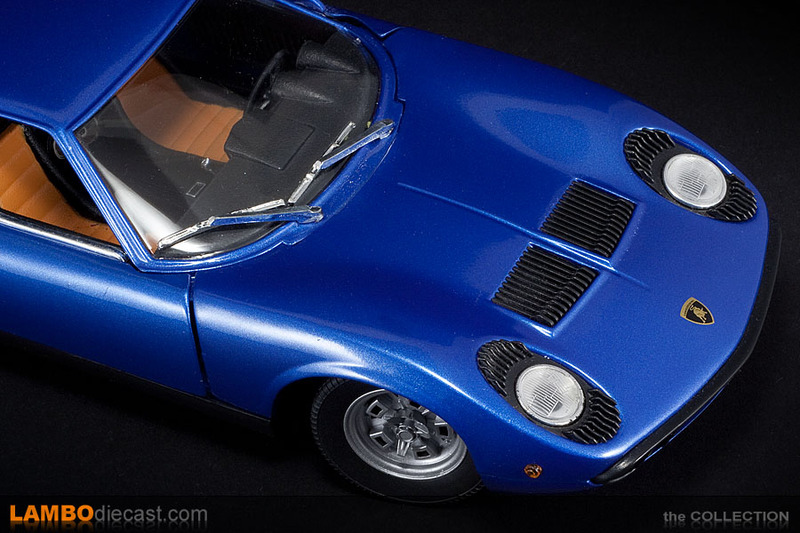 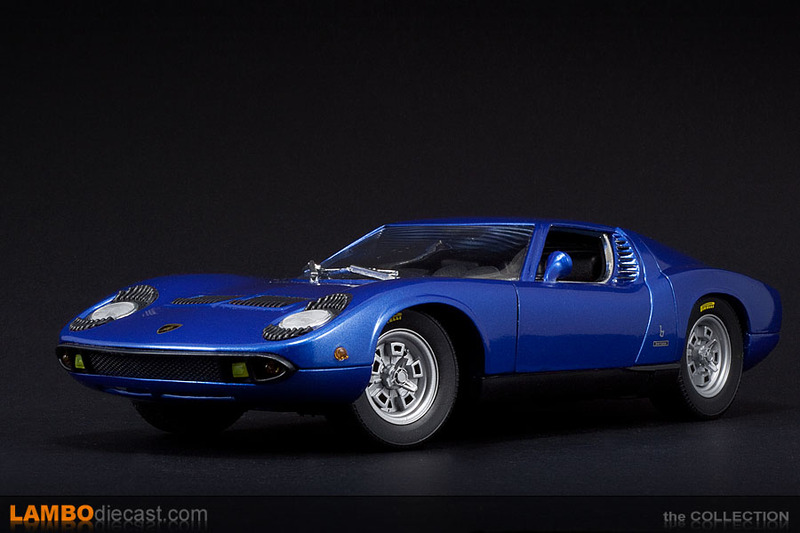 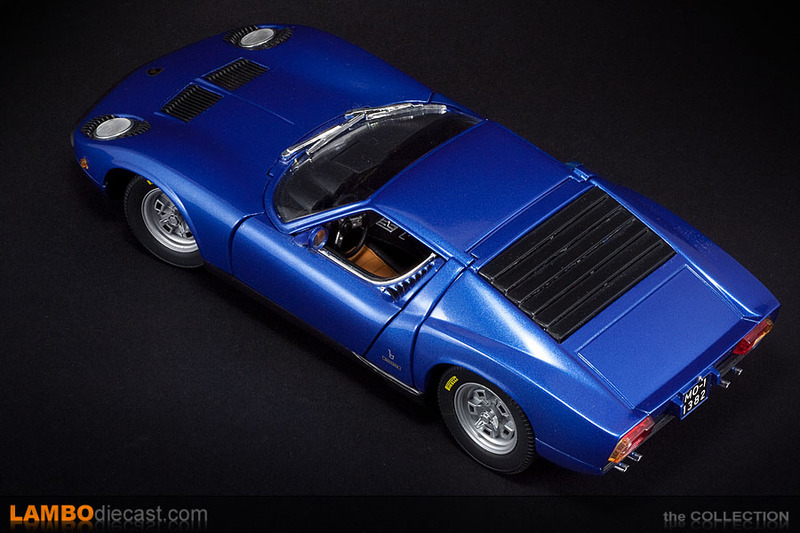 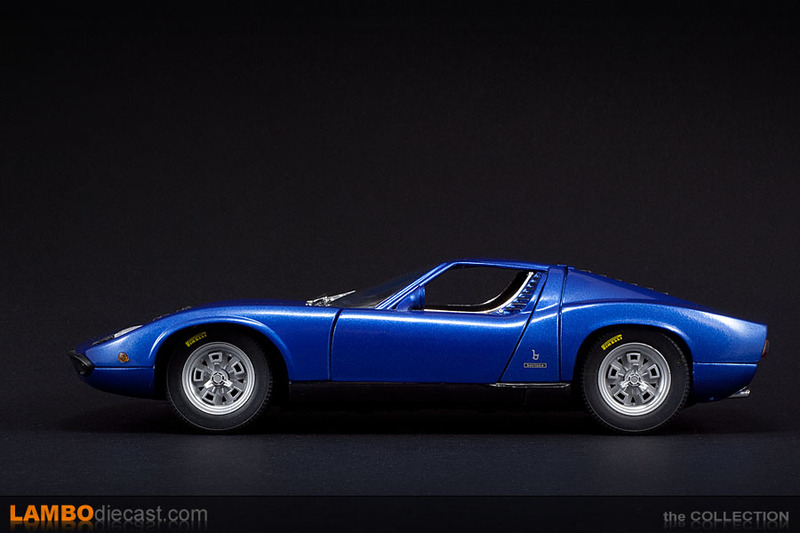 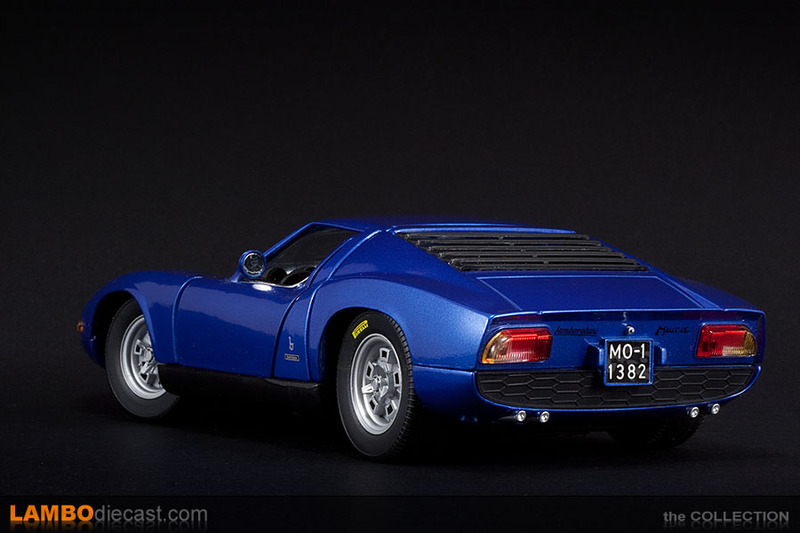 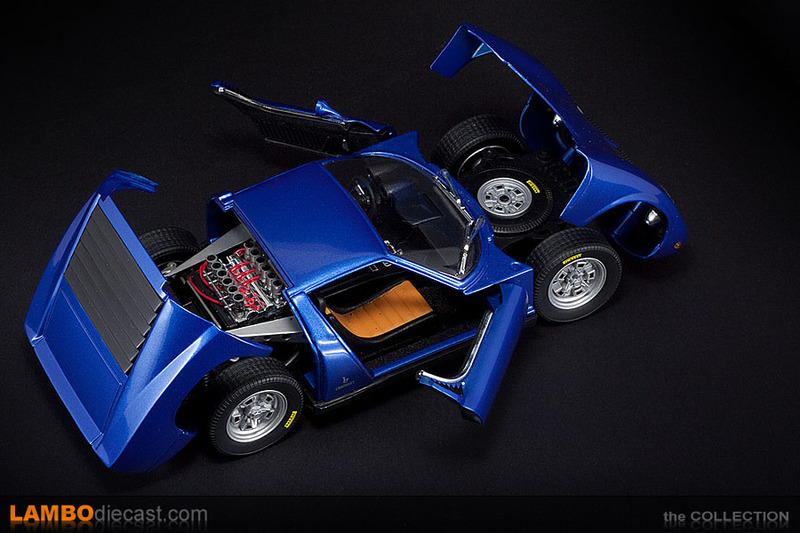 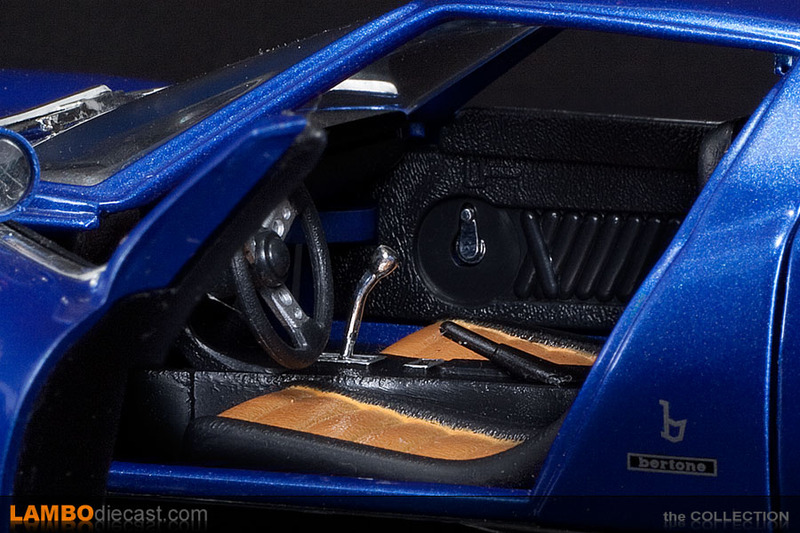 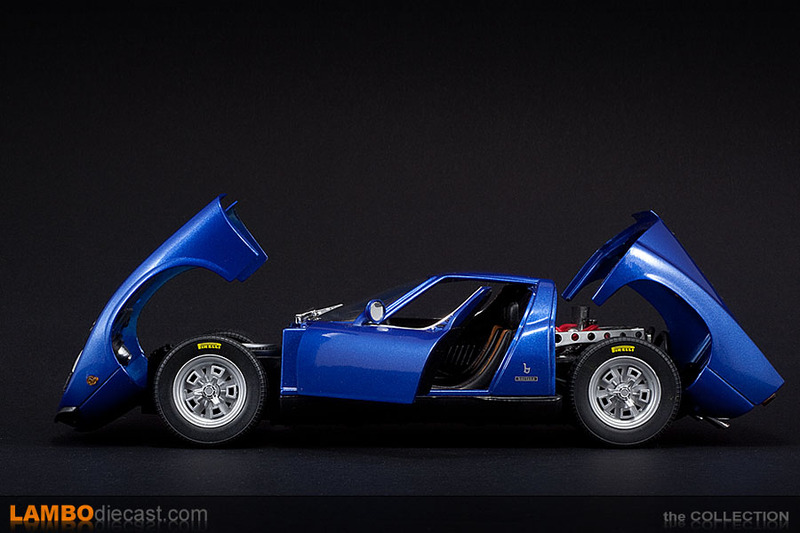 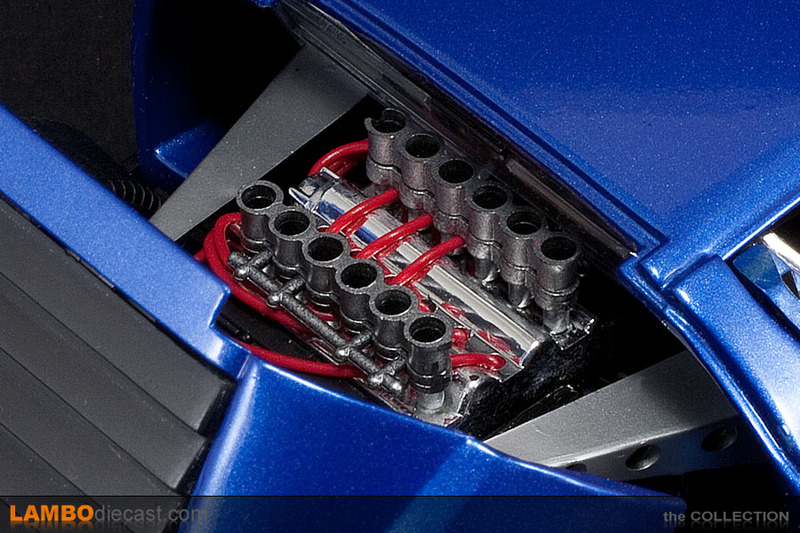 Naturally Anson isn't putting the best Miura model together in 1/18, that effort is done much better by Kyosho and AutoArt, but this is also reflected in the price, and for the money these Anson are really good value, even more so as they tend to get a bit difficult to locate these days, especially in this blue shade. 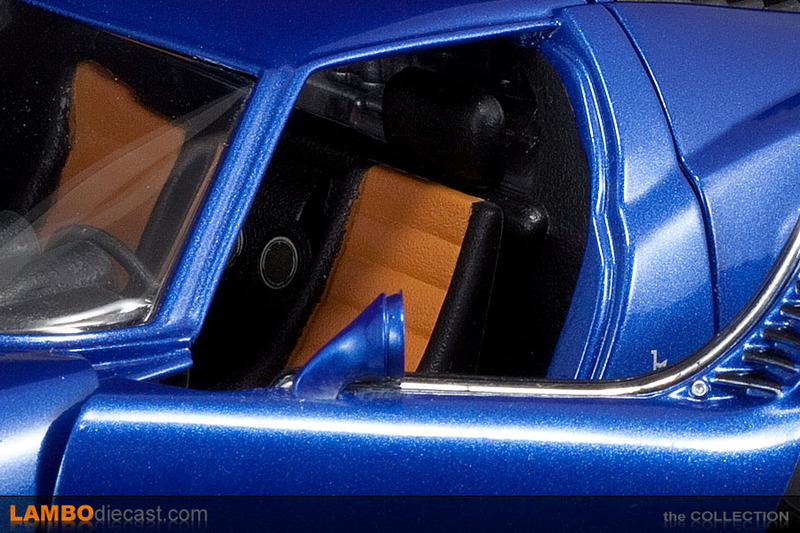 The 1/18 Anson made Miura has four opening parts … they count each door separately for this, so that leaves the large front hood and the engine cover at the rear, all open a very impressive view to be honest. 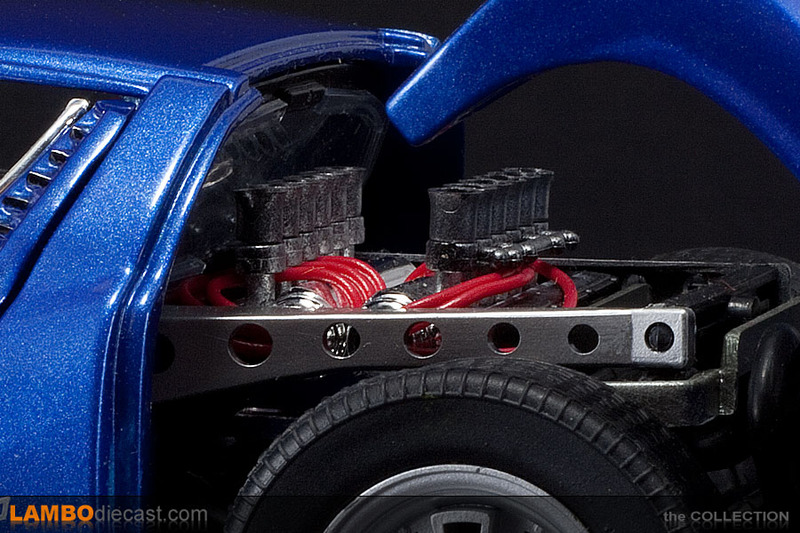 Just don't expect too much detail once you open either hood, up front there is a spare wheel, but for the rest it is just a block of black plastic under there, at the rear it gets a bit better, there is a V12 engine with open carburetor funnels, very impressive but highly unlikely in real life I think, the plug wires are bright red … and that's about it for details on the engine, a nice effort and surely in style with the price of these models when they came out, but today we tend to expect a bit more. 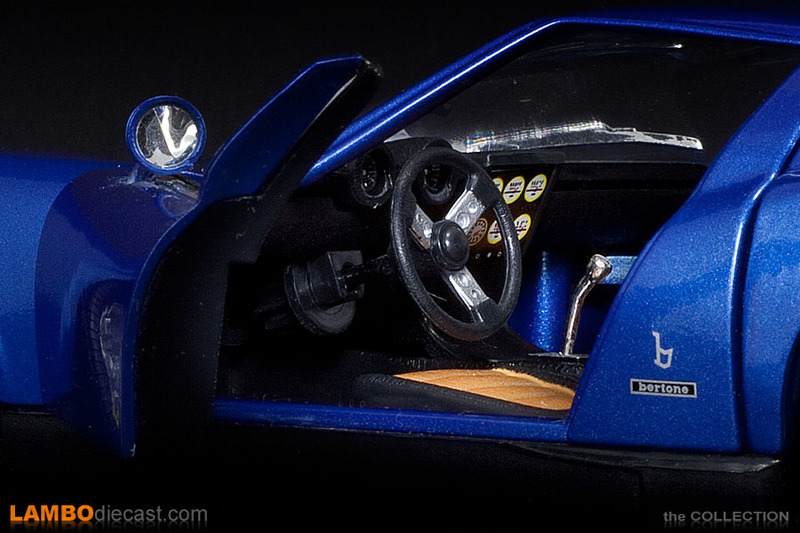 The headlights are fixed, they can't be flipped open like on the Kyosho model, but hey, I can live with that, the large side indicator is a bit out of scale, as is the Raging Bull crest up front, the windshield wipers aren't the most finely made either and what is to be the exterior rear view mirror could be used to bake an egg in real life … but that's not important for me on this kind of model. 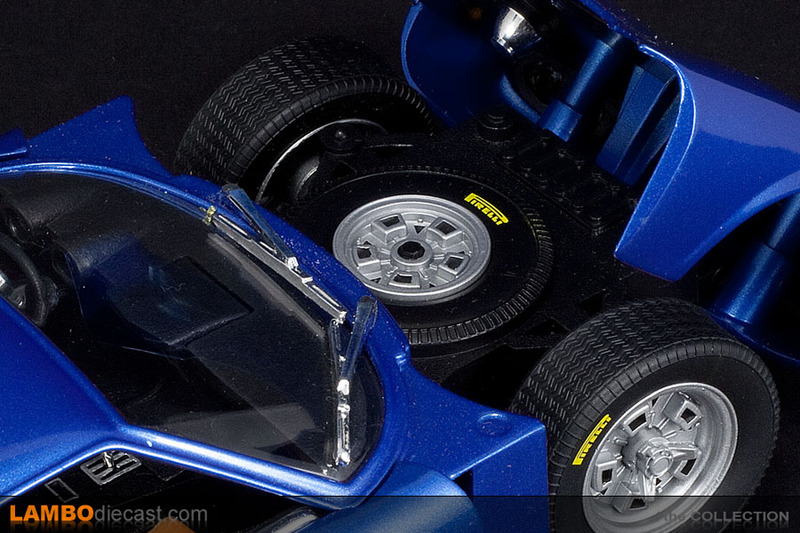 The Anson is a contemporary model from the days I was buying Maisto and Bburago models, so there is some nostalgia in this, the red version of this model I actually bought when it came out back in the days, the yellow one I added because it was cheap on the second hand market … and this blue metallic I bought because it wasn't too expensive and I really like this shade on the Miura. 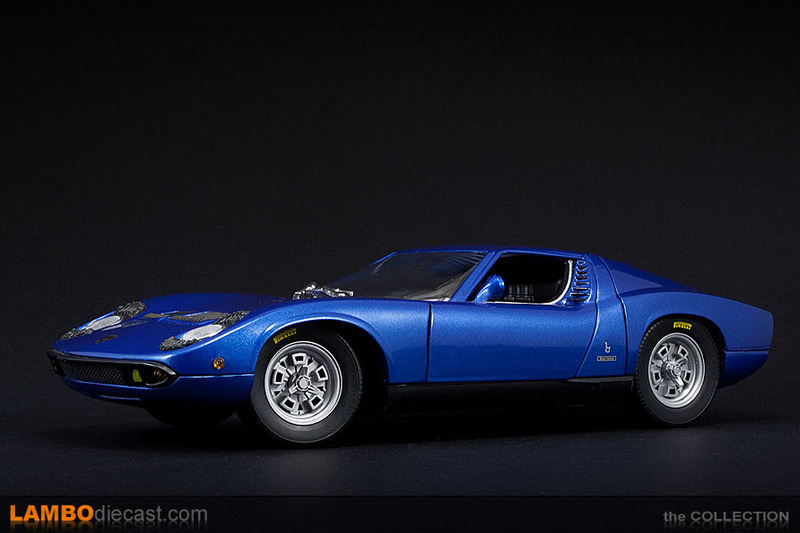 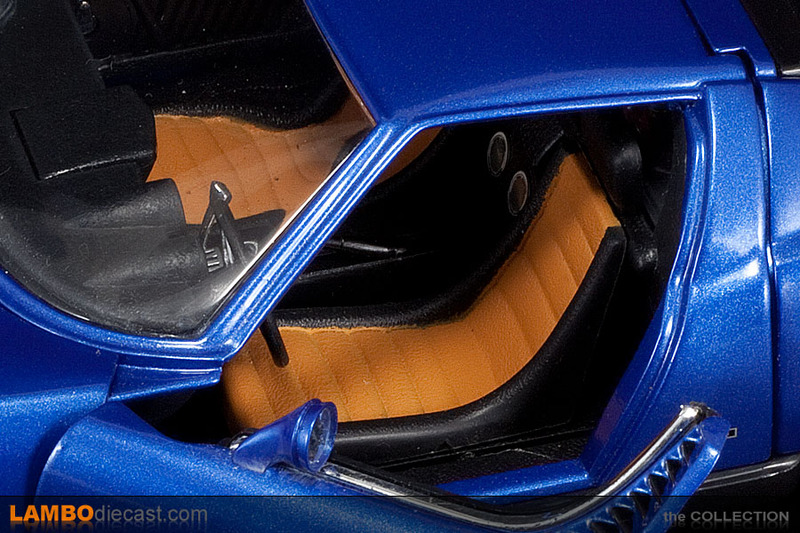 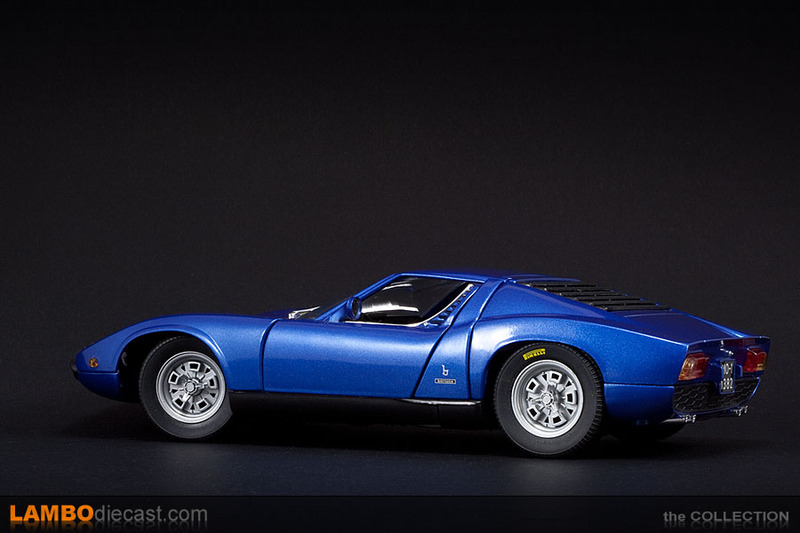 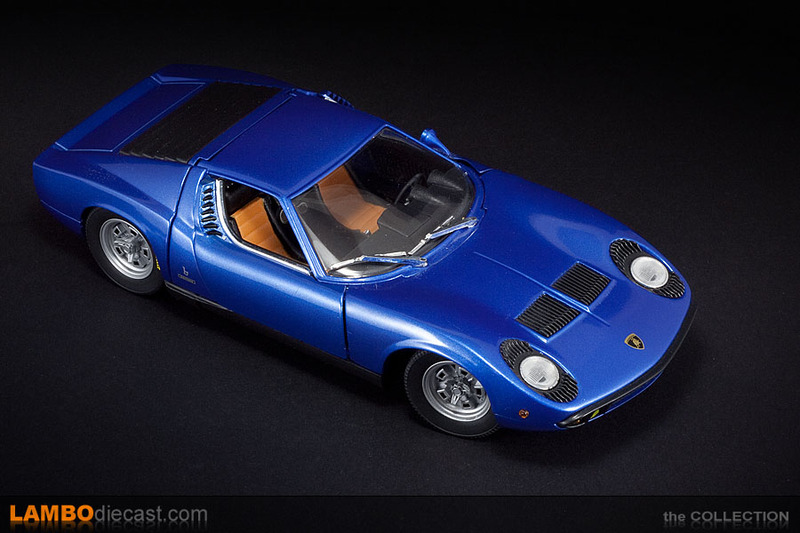 Note that the red Miura from Anson rides on gold painted wheels and has the gold side skirts, however both the yellow and this blue shade have silver painted wheels and black side sills … which actually look very nice on this shade … gold wheels would make it look a bit tacky I think, perhaps this blue shade would also work with silver painted sills … but I'm keeping it original. 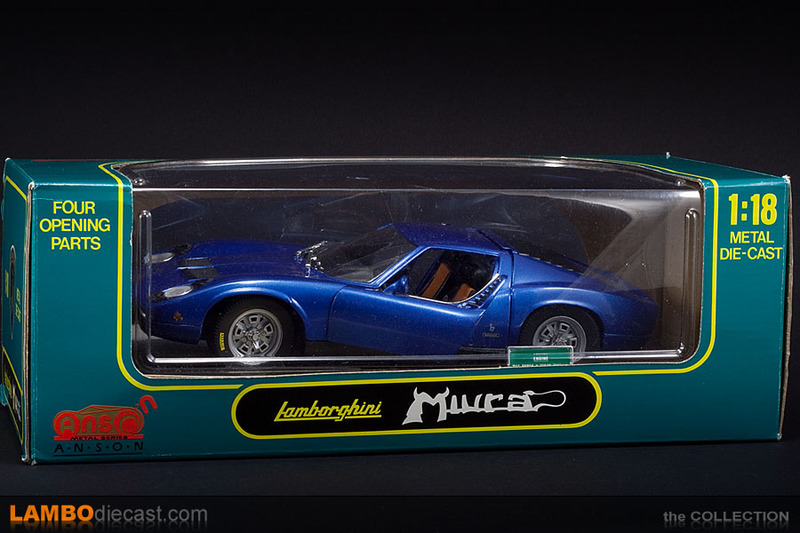 So is this Anson Miura P400 in 1/18 scale a must have for your collection? 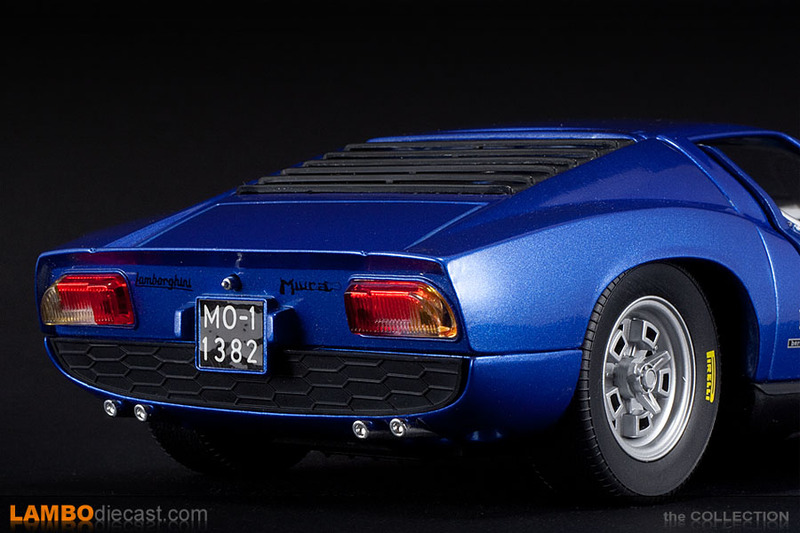 Depends on how you collect models I guess, if you are looking for a near perfect recreation of a Lamborghini Miura in 1/18 scale you might not be very happy with this one, you should be looking at the different Kyosho models, but if like me you collect Raging Bulls and happen to like this shade I would say go for it, it won't burn a large hole in your wallet, and it does look very nice on the shelve … even next to an AutoArt or Kyosho counterpart.